Asai Chu was an artist of the Meiji era who pioneered and moderated the development of the yoga (Western-style) painting movement in Japan. This exhibition features a number of paintings by Asai that are permeated with a calm and relaxing clarity together with works by other Japanese artists who lived and worked during the same period. In Art Fair Tokyo 2019, SHIHODO GALLERY would like to introduce three artists, Tama Ragusa, Keiki Yamada, and Yukyo Yamamoto. We would like guid you through the change in the artists and their works the time changes. Tama Ragusa is an artist who lived in the shifting time when Japan started moving toward modernization about 150 years ago. Keiki Yamada paints things around him using classical Renaissance style and brings back viewers’ memories and past experience through his works. At the same time, he aims to pass on those memories and objects he paints to later generations. Yukyo Yamamoto seeks to show connections between viewers and the modern world using things around him like one yen coins in his pockets, rice, blue sheets, and so on. I hope you enjoy the taste of each of these artists and see how their personalities are reflected on their works. In 1861, right before the time Japan started moving toward its modernization, she was born as the second daughter of Kiyohara family who was manager of the famous Zojo-ji temple in Edo period. Tama was learning art from Japanese artist since she was 11. When she was 15, she studied under Vincenzo Ragusa, an Italian sculpture professor who came to Japan as a foreign advisor in Tokyo Institute of Technology, the school founded by Meiji government. In 1882, she went to Italy with him upon his return to his home country, Italy. She gained a lot of experience in oil painting there. She married him in Catholic church in Palermo in 1889 and adopted the name Eleonora Ragusa. It is said that she lived in Italy for such a long time that she almost forgot her first language Japanese. She continued to be active in arts and received numerous awards that she became a vice-principal of the art school in Palermo. She remained in Italy even after her husband’s death. However, in 1931, a Japanese journalist Takeshi Kimura found out about Tama while he was traveling in Italy. He covered her story in a newspaper after he went back to Japan and brought fame to her back in her home country. In 1933, she returned to Japan. Her exhibitions were held in different parts of the country. She passed away in 1939. The great work of this Japanese female artist is still legendary to this day. Her gentle style in her works shows her flexible and tough personality and many of female collectors like her paintings. 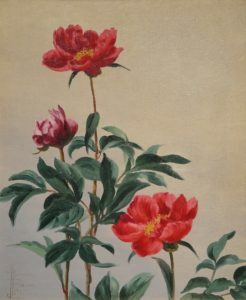 In this exhibition, we introduce mainly her water-themed and flower paintings from the time after her return in Japan. These paintings show you the reflection of education in Meiji period. 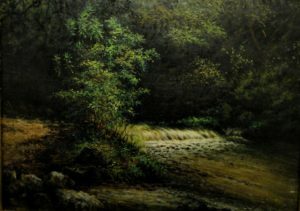 He seeks to master oil paintings and tempera technique that have been around since Medieval time. Using these techniques, he paints things that he has been closely interacted. In this modern society, relation of artists, theme of art works, and viewers has greatly changed. He puts a focus on painting objects that have to do with his own past memories and experience. 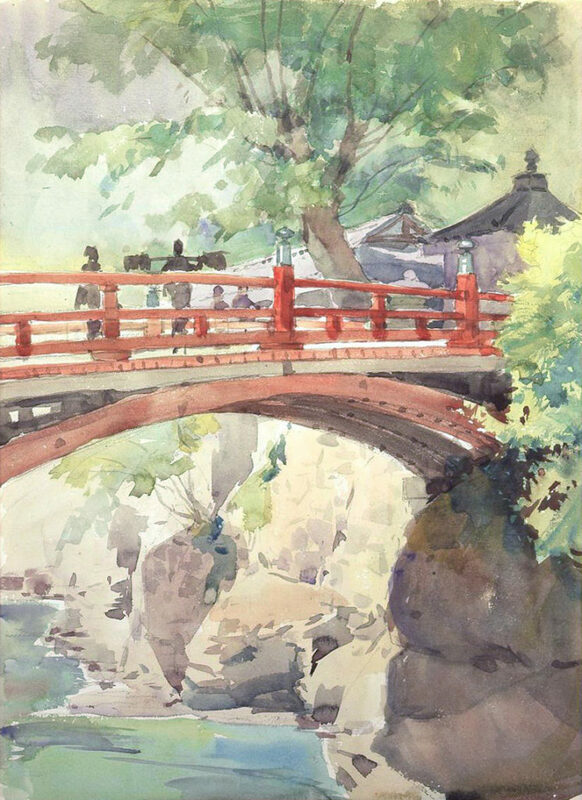 Works of Yamada bring you meaning and joy of art that come from even old time. They are questioning the definition of art in modern society. 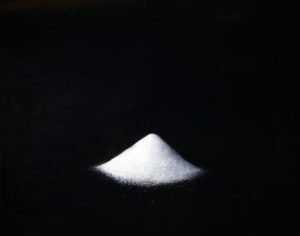 In this exhibition, we introduce works that themed salt piles. Salt, the food that is most closely attached to our lives and the most universal in any kind of food, is the most essential theme of his works. Salt piled in a cone shape means purification and praying. He has been painting salt piles every time conflicts and natural disasters occurred. However, painting each grain of salt, he says that he feels as if the pile of salt is a mountain that he has to climb just like he achieves his goal. The theme of his works in this exhibition is “Golden life”. As the word “Golden” says, it is composed of 4 series of works using currency, gold, and gold leaves. 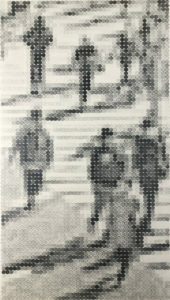 “One coin people” is a work that depicts a group of people using one yen coin frottage. This work shows each little one yen coin as human while it has an ironic meaning that people cannot live without money in this society. Their face looks vague and the resolution of the work represents uncertainty of their existence. The works displayed next to it are portraits of famous business managers. They are usually known for having enormous amount of money which is literally golden life. However, because of the big amount of money they own, their actual personalities are forgotten and money they own is the only aspect people see. This implies that, whatever form it is, we cannot get away from obsession with money. Or perhaps that is the only way we can see these wealthy people. On the other hand, the wealthy people are not bounded by money, but they rather freely enjoy being in such a wealthy world. Ironically, the reason we can see them smiling in Yamamoto’s works is that he used even more coins to make them. It is a series of works that depicts bills and cryptocurrency using one yen coin frottage. While exchange rates keep changing every single day, it makes us feel as if it is happening in another world just like videogame you play with your friends. However, the change certainly influences our everyday lives.His series of works called foreign bills series, using such as dollar bills, tell you exchange rates in an interesting way by naming each work “1 dollar=OOO yen (number of coins he actually used)” Therefore, bigger the size of work it gets, the more coins he needs. Similarly, the smaller the size of work it gets, the fewer coins he needs. It shows how exchange rates actually happen. Also, in his works that depict scattered bills, he emphasizes how currency might be actually unreal. Moreover, his skeptical view on cryptocurrency like bitcoins makes us wonder what currency is after all. It tells you that bills and cryptocurrency could be made up with our imagination after all. It is a series that depicts objects on dollar bills using gold leaves. Originally bills appeared as substitutions of gold and other gold items. By using gold leaves on the bills, it has a form of nesting structure. Images depicted on them are coins and other items that don’t physically exist but have values. These are made based on gold ingots. They look like cardboard-made capsule hotels if you look at them from the back.People cannot even sleep without money.